Chop onion, shrimp and coriander fine. It is easiest in a food processor. Mix all the ingredients and gently mix them together into a uniform dough. Fill a flat plate with water. Dip the rice paper in the water, on both sides, so it becomes completely wet. Put it on your "folding" area, such as a cutting board or a dry plate, and let the rice paper soak up the water to make it soft. Put about 1 topped tablespoon of force meat 1/3 inside the rice paper. 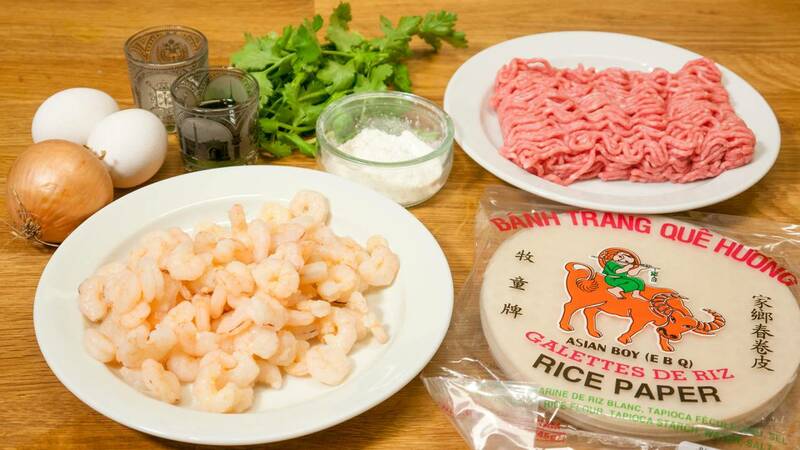 Fold the rice paper as tightly as possible. Avoid air bubbles. When you reach the center, fold the sides inwards. Make sure that the end is a bit narrower than the roll itself, so all the rice paper is folded round the roll and not hanging like "flaps". Fold 6 rolls at a time and fry them. Put oil or lard into a regular frying pan. ½ - 1 inch (1-2 cm). It must at least reach to the center of the rolls. Heat the oil up approx. 320°F (160°C) or until a piece of wood starts to sizzle in the oil. The oil must not smoke, that is far to hot. Cook the rolls 6 at a time in the pan so that they do not touch each other. If they touch each other even just a little bit, they stick together and are really difficult to separate again. When they are golden and crisp they are finished. It is hard to judge with rice paper, but you can quickly find the color after a few tries. You could start out by frying just a few at a time until you get the hang of it. If you use regular Asian spring rolling sheets, it is easy to judge by the look. Just mix all the ingredients and stir until the sugar is dissolved. It is a good idea to do it first of all so you do not have to wait while the rolls are hot. Or use syrup instead of sugar. The tradition is to share a bowl of dipping sauce, but I usually serve it in portions, in small glasses. 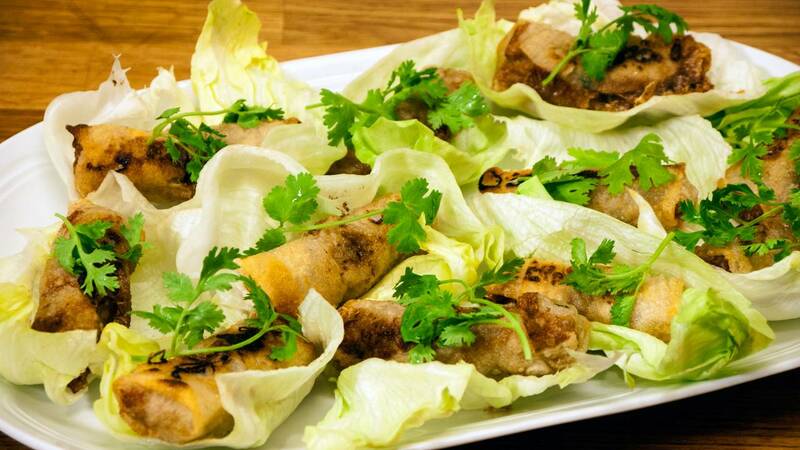 Serve with lettuce leaves cut in half. They should be folded around the roll along with some fresh coriander. It is of course optional, but much better than just eating the rolls. I have recreated the recipe by taste, from my local Vietnamese restaurant, so it may be wrong, but it tastes like theirs. 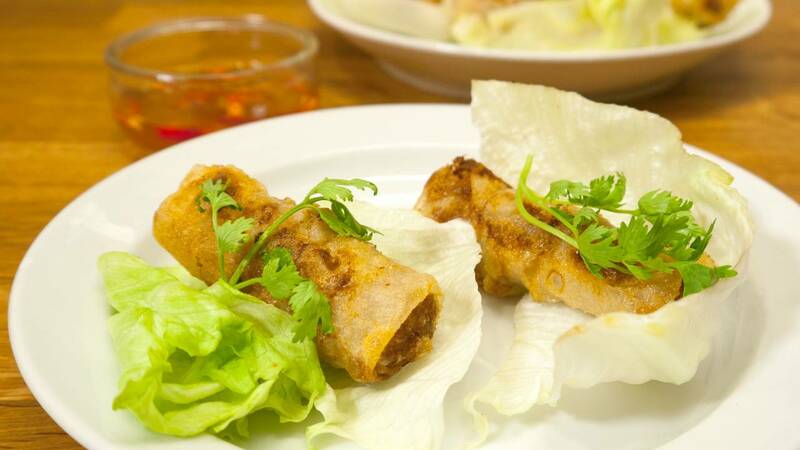 You can easily use plain spring roll dough for these. It's just as good. Both types are sold in your local Asian supermarket. 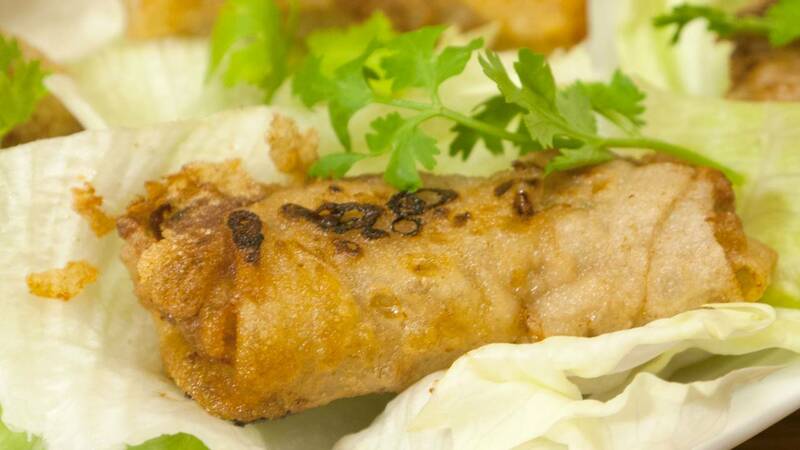 The spring roll sheets are often frozen. If the rolls are a little burned on the outside and on raw inside, then the oil is too hot. If the rollers do not get crips, the oil is too cold. It's not that hard but it might take a few tries. The first time you make them, it is worth paying a few "victim rolls" to find the right temperature and time that suits your stove. They can be rolled in ahead of time and frozen, after which they can be taken out and fried from frozen.